The next two weeks are typically the slowest two weeks in the search industry (and probably most other industries). It is the holiday week, with Christmas and New Years coming, as well as it being the first day of Winter today. Like I said, Google will have a new logo each day (maybe I will update this post here or make a new one for those). Happy holidays, cold winter and relaxing/healthy next two weeks. Forum discussion at Search Engine Roundtable Forums and Google Web Search Help. 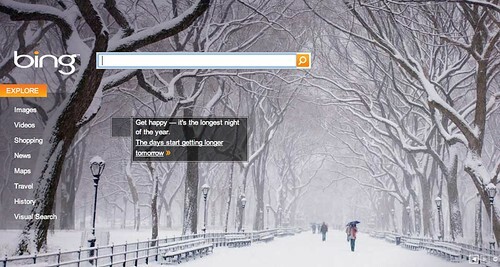 Update: Bing, Yahoo, Ask and many others posted their Christmas eve logos. You can see them all at Christmas Logos From Google, Yahoo, Bing, Ask & Others (2009).